Don’t you hate it when one of your blogging friends drops off the face of the earth for a while without any explanation whatsoever?? I’ve been AWOL for about five days now, but I have an excuse a reason. It was my birthday, and my son Domer had BIG PLANS for the two of us! This was a night game, and we knew we wouldn’t get back until very late (making rising early for Mass a hardship). Never fear, Notre Dame had that covered. 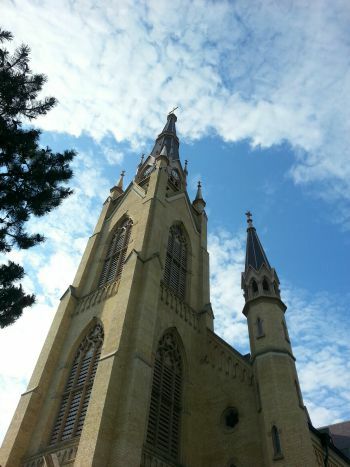 What’s more Catholic than attending Mass at the Basilica right on campus before kickoff? So, what did you do over Labor Day?!? 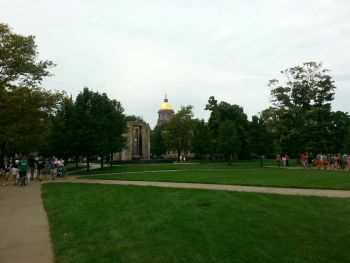 This entry was posted in Notre Dame and tagged birthday celebration, cake, football, Irish Guard, Notre Dame v. Texas, traditions, Trumpets in the Dome. Bookmark the permalink. WOW! Happy Birthday Debbie. Sounds like you had a most wonderful day which sets the stage for a most wonderful year ahead!! 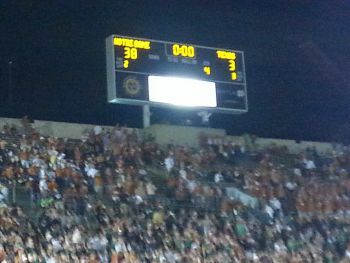 ND won and you had your cake! TWO CAKES. Knew you’d appreciate this one, Kb! Thanks for the good wishes. If you knew how CHEAP Domer tends to be, you’d realize he really brought it with this B-day. I can’t brag him up enough! Wow. What a birthday. I watched the game but didn’t see you in the stands. Your photos brought back the memories. 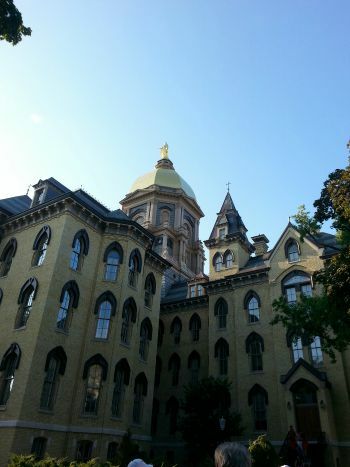 You can never see the dome without feeling a certain nostalgia for the life there. 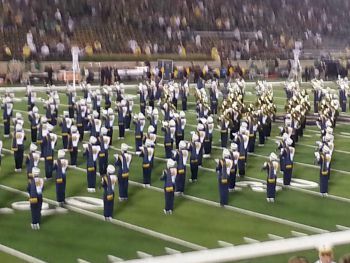 During the game, they had a tribute to Father Ted. Couldn’t help feeling sad he is gone. 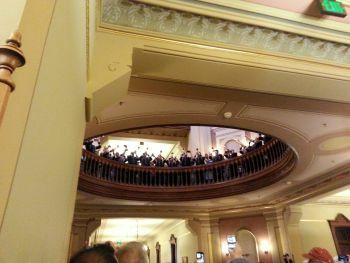 How did Domer feel seeing the band and trumpeters? I’ll bet he wanted to be on the field. Thanks for the trip. We were the ones yelling and standing most of the game, John. You saw us, right?!! Well, with 80,000-plus watching from the stands, it’s no wonder, right? We heard the tribute to Father Ted, and I agree it was very moving. Feels odd not seeing him around campus these days, but I imagine he pulled a few strings and was watching from a better seat! Domer, of course, misses his college days — Band was his life, and seeing his alumni friends as well as his friends still in the Band was a treat. Glad you enjoyed the trip vicariously. Well first of all – happiest of birthday wishes to you! And secondly, it says a lot about your parenting to have raised such a kind, thoughtful son. He obviously loves and appreciates you very much! Thanks, Barb. It was a splendid birthday, and I have to admit, I celebrated the entire weekend! What a nice compliment — we moms do the best we can to guide our kids into being thoughtful and kind. I’m blessed the training “took”! Domer has always been big-hearted, but he’s never been much on keeping Hallmark in business. That’s why his generosity this year really made an impression on me and I had to share it! Awesome! And yay two cakes! Suzi, I’m going to look like a cake when these two are finished, ha! Fortunately, I don’t have to eat both of them all by myself — nobody needs that much sugar!! Ah, Kim, what a sweet thing to say! And if I could share these two cakes with all my blogging friends, I’d love it (and I wouldn’t have to worry about putting on some unnecessary weight, ha!) Love to you bunches! Thanks bunches, Lucy! Oh, yes, Domer spoiled me rotten, and I loved it! After all, we moms spend years spoiling our kids, and it’s cool when they return the favor. Especially cool when the “kid” is as frugal as Domer normally is, too!! 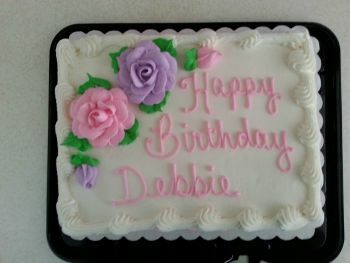 Happy b-day, Debbie! Wow! ND is beautiful! I would definitely explore that place. And cool that you got to go to mass in the evening before the game. Two cakes! Super nice. Domer is the man! Thanks, Professor. You ought to see campus in the Fall — it’s gorgeous! And I’m told the depths of winter are lovely — peaceful and quiet. 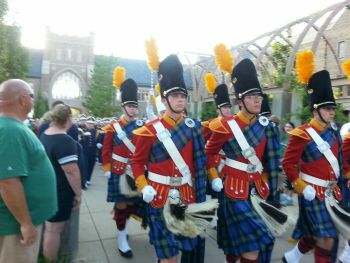 By the way, the Irish will be in your neck of the woods Nov. 7 for a game vs. Pittsburgh (you should sneak by the stadium and hear the Band — no guitars, but lots of cool sounds!). Yes, can you believe I got TWO cakes?? So awesome — Domer definitely is the man!! Will they be here? Aha! But I bet everyone will be going for Pitt! Pah. I’ll go for the Irish just because you’re a Pats fan now! They absolutely will, and you should try to see the Band (if you’re anywhere close by, you’ll definitely hear them!). No, ND has LOTS of fans on the East Coast, particularly Jersey and New York. Lots of Irish, you know! This is just wonderful. Happy birthday to you, and blessings to Domer for his love and attentiveness. 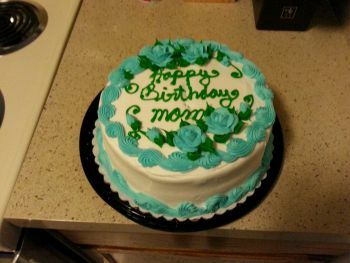 Two cakes? You really rate, lady! Thanks, Linda. Yes, Domer was amazingly forward-thinking with this whole thing. When he mentioned the tickets, I just assumed I’d reimburse him, but he wouldn’t have any of that. Nor would he let me give him any money when we parted and each returned home. Golly, I’m blown away at this maturity, all of a sudden! 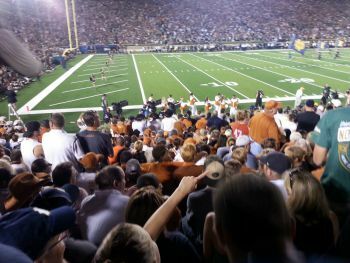 It’s been almost 10 years since ND played Texas, and ND has come out on top for most of those match-ups. 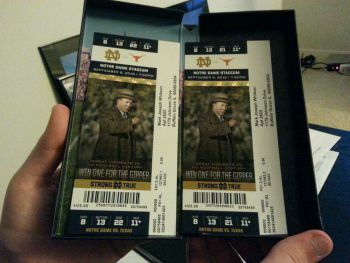 Before kickoff, I told Domer he really couldn’t lose this one (he’s an Irish fan through and through, but he was born in Texas!). And it was well worth the price of admission to watch Domer and his buddies catching up on old times!! I’m seriously late on this, but happy birthday! Maybe we can just say I’m super early for next year :) It sounds like you had a great birthday and Domer and your mom took care of you nicely.